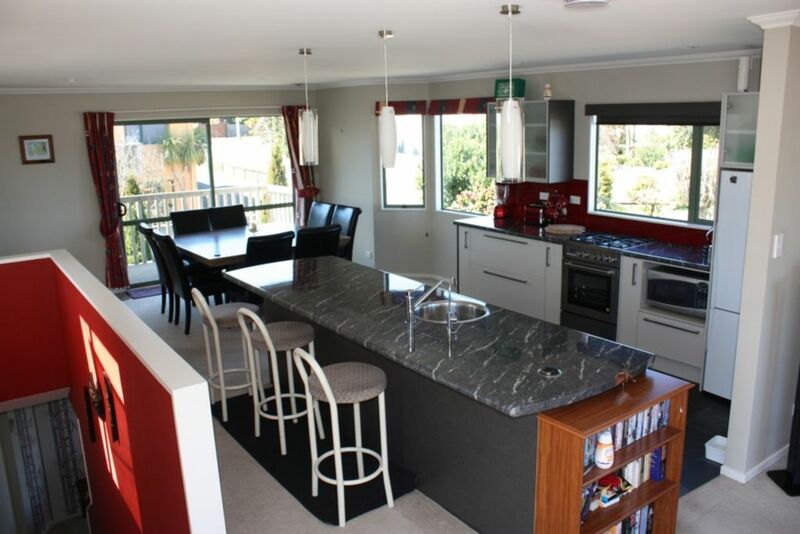 The ultimate family getaway this lovely two storey, four bedroom home in the sought after "Bird Area" of Taupo will help ensure your time in Taupo is a memorable one. A short stroll to Taupo township and the Great Lake. Plenty of room for all the family here. This home accommodates guests comfortably with 4 Generous double bedrooms and 2 separate lounges/ living areas plus a dining area for enjoying some home made cooking or local takeaway. The Lake peeks are just enough to know whether to take the boat out for the day or whether to bask in the sun by the lake or dipping into the beautiful waters of Lake Taupo. The open plan kitchen, dining and lounge create a family friendly environment. French doors open out to a massive North facing deck for relaxing and soaking up the sun or just enjoy a BBQ with the family. There is a small lawn area - and we can be small dog friendly too😀 just ask! Large double garaging for all the toys and off street parking for a couple of vehicles. Just the place for an easy care holiday so close to all that Taupo has to offer and a quick drive to Rotorua to enjoy the culture. Why wouldn’t you bring the family to stay? A helpfful inhouse compendium assists you to decide how to make the most of your stay in Taupo and the surrounding areas. A peek of the lake can be seen to determine if it’s a swimming, fishing, or a chill out day to be had. Click the door and it dries real quick, otherwise a clothes horse is provided as well as outdoor line. Clean and instant gas at your fingertips! The pool table holds the centre stage with a dart board to the side. Large fridge freezer, with another one downstairs as well! We have coffee plunger for you to use if you wish. Just about everything you need to whip up a treat! Sunny, warm and bright - the heart of your stay with BBQ facilities just outside on the balcony. Huge kitchen/breakfast bar as well as a beautiful stone table to gather around. Upstairs, downstairs plus also in main bedroom - but your on holiday go explore! Downstairs is sleeping facilities with most of the main living area being upstairs, so not really suitable for wheelchair access. Mature/senior adults and those with families are encouraged to enjoy our home. A huge family home - so Suitable for families and athletes competing in one of the many sports Taupo offers. So close to town yet such a private and tranquil setting that allows you to enjoy your stay whatever the reason may be. Nice place to stay, very close to town and things fun. Great communication from the owners. Was awesome how close the property was to the water! We went every day. Walkable distance into town as well. House was really gerat, had everything we needed. Although it did say wifi which we relied on and it didn't work. Great for a big group of people, outdoor deck is awesome! This was a great place to stay. Close to the lake, very good facilities, comfortable beds and quiet. We really enjoyed our stay. It was very good for an extended family, lovely and clean and Karen was great to deal with.